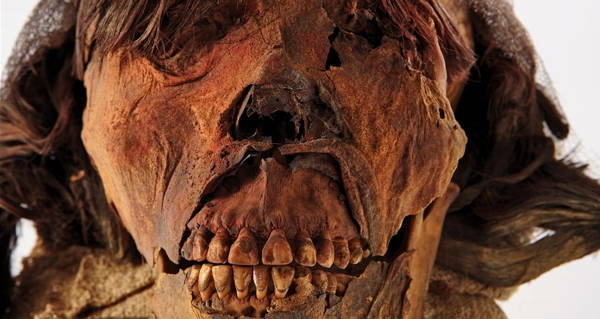 We still may not know what killed the Señora of Cao in Peru 1,600 years ago, but we now know what she looked like when she was alive. After the Señora of Cao died, the Moche took the young woman’s body to the top of a temple, carefully wrapped her tattooed corpse in 20 layers of fabric, and buried her alongside four V-shaped crowns and other treasures in an ornate tomb. This is where she would stay until she was discovered by archaeologists in 2005. She was the first female noblewoman ever discovered from this civilization. And now, after years of being hidden away in a climate controlled room, she’s finally going to be exhibited to museum-goers in Peru, in a manner of speaking. The mummy is too fragile to be shown publicly and even with careful preservation, researchers know it is bound to decay even further as time goes on. So, using the latest 3-D forensic technology, normally used to solve crimes, experts from around the world have created an exact replica of the remains as they are now. With the replica, they won’t have to worry about decay. “That kind of record could keep this extraordinary discovery alive for many generations to come,” archaeologist Arabel Fernández López told National Geographic. Though the bewigged mummy is interesting to look at, she doesn’t really do justice to what the Señora once was. So, in addition to the replica, researchers created an incredibly lifelike sculpture of what they think the woman looked like when she was alive. They started by taking photos of the mummy with hand-held laser scanners. Those scans were put into computer software that would strip the image of the face down to the bone. Researchers then worked from the skull back up, adding on facial muscles and features based on their best educational guesses from studying cadavers, Moche paintings, and photographs of Peruvian people. Once they had created the face on the computer, they used a 3-D printer to build a model, which was then decked out in clothing and jewelry that scholars thought would suit her high status in Moche society. Conoce el rostro de la Señora de Cao y acompáñanos a leer esta nota que realizó el diario El Comercio. Next, read why researchers think they’ve uncovered the lost Eighth Wonder of the World. Then, check out the intact medieval sword that a Polish construction worker recently pulled out of a swamp.